Cold point tropopause; cold tropopause; tropospheric stratospheric exchange; radio occultation, subtropics; atmospheric sciences; climate; upper atmosphere. The tropopause height and tropopause temperature are sensitive to temperature changes in troposphere and stratosphere. These are the measures of global climatic variability. Atmospheric profiles of temperature, refractivity and water vapour are always needed for communication, navigation and atmospheric modeling studies. 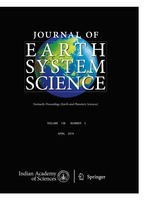 The tropopause characteristics over the Indian region have been studied using radio occultation measurements (CHAMP) on the basis of cold point criterion. Tropopause height shows large variation in the latitude range ∼30° $–$40°N during winter. Tropopause temperature less than $−$82°C, assumed to facilitate troposphere to stratosphere air transport, is observed at a number of tropical Indian locations and no seasonal pattern is observed in its occurrence. The bias in temperature and refractivity deduced from radiosonde and radio occultation measurements is also presented. Radio & Atmospheric Sciences Division, National Physical Laboratory, Dr. K S Krishnan Marg, New Delhi 110 012, India. Department of Physics, Post Graduate Study Centre, Sri Krishnadevaraya University, Kurnool 518 002, A.P., India.